I was certain I wrote this post weeks ago. I'm sure I didn't lose it. Someone must have taken it. Yeah. That's what happened. Okay, I became interested in Stone Giant: Michelangelo's David And How He Came To Be by Jane Sutcliffe when I heard the author speak about it at the Connecticut Children's Book Fair. (I know this isn't the first time I wrote that sentence.) She described how she saw the Biblical David's story in the face of David, the statue. 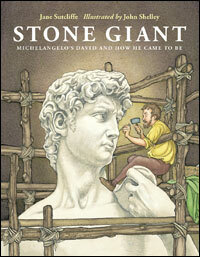 But Stone Giant is the story of David, the statue, not Biblical David. There are several great elements here. The historical context. The great illustrations by John Shelley. And the basic narrative about a big stone waiting for someone to find David in it. I like children's books about art. But Stone Giant is about something more specific. It's a book about a specific piece of art. It's also an example of a nonfiction author finding and writing about a little known historical event. Jane, and I say Jane because (FTC transparency moment) she's in my writers' group, has a new book coming out in March, Will's Words: How William Shakespeare Changed The Way You Talk. She'll be signing copies this very weekend at the ALA Midwinter Conference in Boston. Thank you for the shout-out, Gail. You are a doll! Hey, I've liked your books.